Lipid profile can also be ordered in cases where assessment of lifestyle modification and also effectiveness of statins in patient who already have deranged lipid profile. Indians are more likely than other races to develop heart diseases. 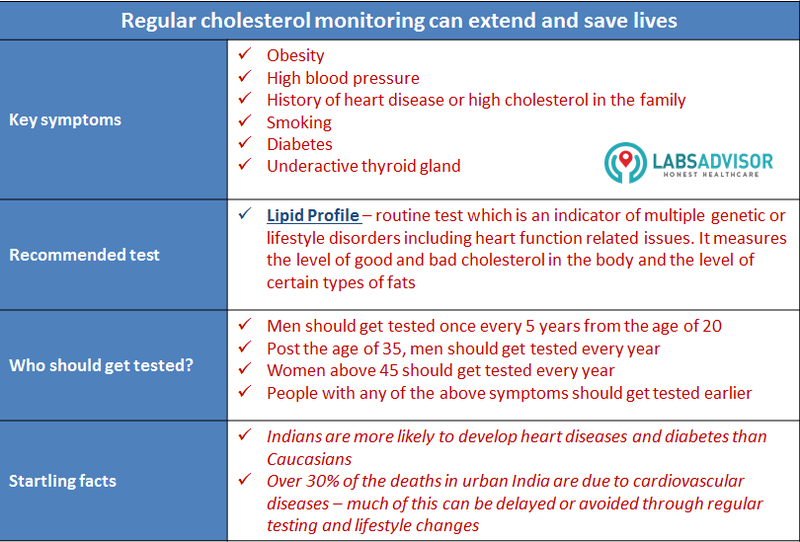 It is recommended that Indian men get lipid profile test done at least once in five years from the age of 20. Post the age of 35, men should get a lipid profile done once every year. Women should get a lipid profile test done every year after the age of 45. Total cholesterol:This measures the amount of cholesterol in blood. Cholesterol is a kind of fat that the body needs to function properly. While high levels of cholesterol are generally considered bad for heart functioning, newer research is questioning this. You should refer to your doctors advice on how to interpret the results of the lipid profile test. Triglycerides: The calories which the body does not use are converted to triglycerides. Hence, triglycerides are generally considered bad. People who are fat, diabetic or eat too much carbohydrates without burning them, have high amounts of triglycerides in their bodies. Cholesterol/HDL ratio: Ratio of total cholesterol to HDL. It is a calculated value.